The Nano Tamagotchi is essentially the second version of the Chibi/Mini Tamagotchi. It has a few more characters and a different shell design than the first version. 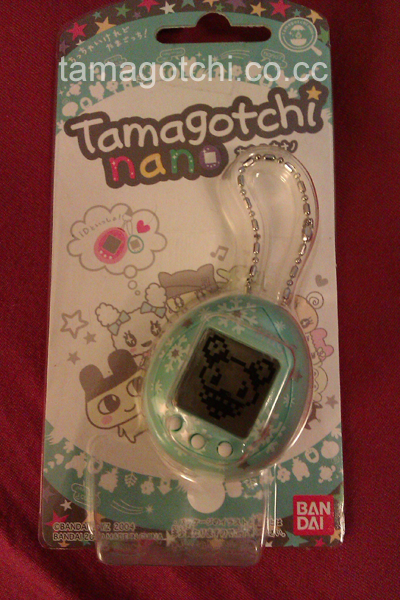 It does not connect to other Tamagotchis since it is supposed to be more vintage style. I have not played with this yet because I already know that it doesn't have very many different features from the original version, so I don't see any reason to open it. I will keep it mint in package for collection purposes. Overall, its a very pretty design. Its interesting because the shell shape is slightly rounder and thicker than the original, which I find cool since its more like a real egg this way. I'm not sure why they did this since it hasn't been much more enhanced, but perhaps they figured it would be cuter and could be used as a phone charm if they changed it up a little. I got the snow-flake design because it was the prettiest and most sparkly :) I'm pretty certain that Bandai only made a Japanese version of this Tamagotchi, but they did make an English version of the original Chibi, which is known as the Mini in English speaking countries. I do not have a growth chart, but there aren't very many characters anyway and the it only transitions straight from infant to adult in a day.